Everything listed is sold caveat emptor, your deal is with the seller not me. I’m not endorsing any scooters, just listing them. Please inspect any scooters fully and satisfy yourself that they are purport to be before parting with any of your hard-earned. If you spot anything potentially dodgy, let me know and I’ll remove it. 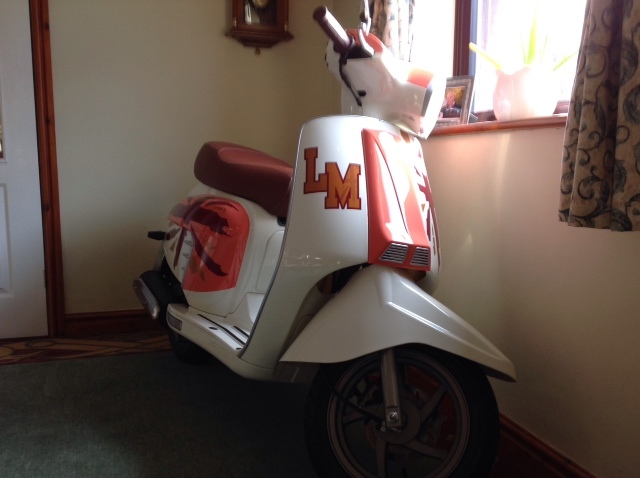 Lambretta LN 125 April 2013 on 13 Plate. It has only covered 25 dry miles and is in PERFECT condition. It has been kept in the house since day 1. This bike is a modern take on the iconic SX200 from the Sixties. 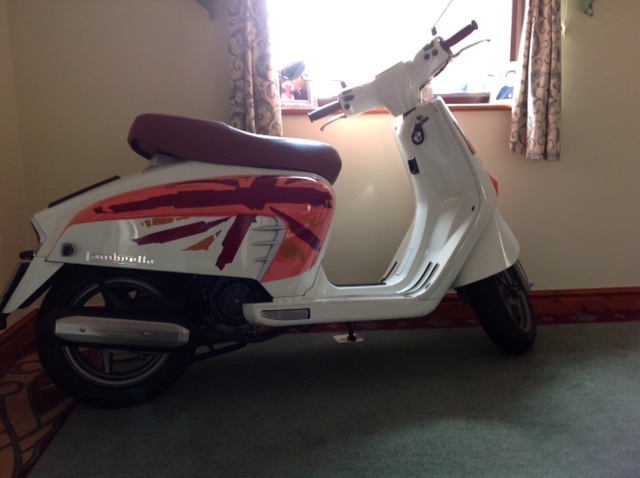 It is a four stroke so is very economical at 70 MPG. Cast wheels with tubeless tyres. Very lightweight bike at 115Kg. 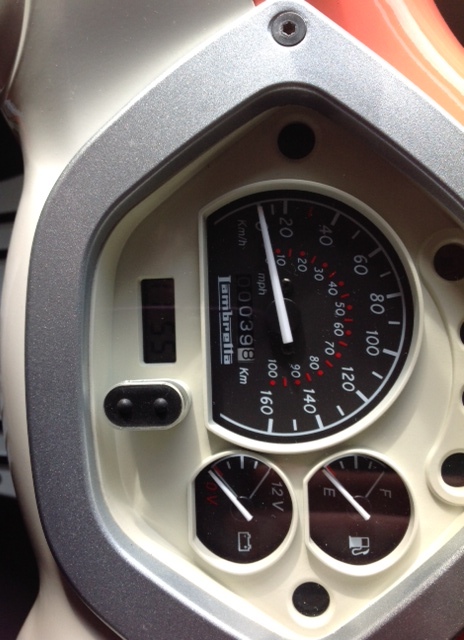 Modern dash with Speedo – Fuel – Battery condition – Clock. It has a front disc brake – side stand & centre stand – telescopic forks – under seat storage – twist & go gearbox – low profile tyres – LED rear light & front indicators – electric start – and this one has a graphics kit which really sets it apart. 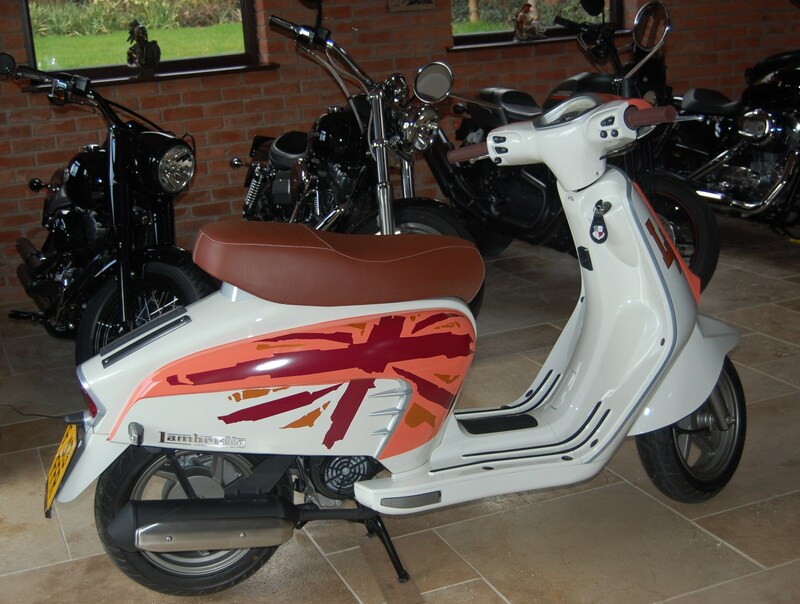 It comes in White & Coral Pink with traditional Brown seat and hand grips. It is really easy to ride with deep padded very comfy seat and would be great for local trips. You need to be around 5’6″ or over. It is under warranty until April 2015. These retail at £3,200 with no graphics and this one is offered at only £2,000 for a quick sale. These have had good reviews and are popular among scooter enthusiasts who like a modern take with no hassle. This bike comes with both keys – V5 – handbook and all paperwork in my name. It really is like new so very cheap. No daft offers please as it is extremely good value already and is only for sale as we are running out of space !